Hallowe'en Artists' Studio Trick or Treat Tour: Haunted happenings! Unfortunately Sue Burgan was unable to join us, but Brenda Dewey has!!! Brenda creates magical creatures, and she's into Hallowe'en BIG-time! She doesn't have a website, so you'll just have to wait until tomorrow to see her work! 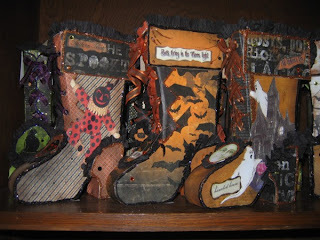 These boots are hers, though, works of art filled with treats for her family and friends!